Br3d peak has overlapping spin-orbit components (Δ=1.04 eV, intensity ratio=0.671). Br-containing polymers may degrade with prolonged exposure to X-ray beam. Stemming from the Greek word for stench, bromine is known for its strong, disagreeable odor similar to that of chlorine. 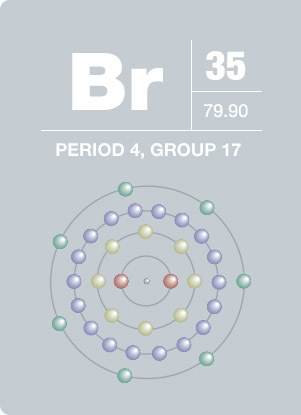 Corrosive to human tissue and an irritant to the eyes and throat, bromine is highly active. It is reputed to be a contributor to the depletion of ozone in the Earth’s atmosphere. Bismuth bonds easily with other elements and has a strong bleaching action. Bromine has been used in many applications including the manufacturing of fumigants, water purification compounds, dyes, and medicines. It is used to make brominated vegetable oil, which is found in many citrus- flavored soft drinks.